Is Acne a Symptom of Vitamin D Deficiency? You are here: Home / Acne / Is Acne a Symptom of Vitamin D Deficiency? In the October 2008 issue of the Vitamin D Council’s newsletter, there was a connection made between vitamin D3 and acne. Although the mention in the newsletter was brief, they linked to a very thorough and detailed study done by AIERLIN T.-R. MAYNARD, M.D. in 1938. My teenage son has type 2 diabetes. I started him on 5,000 IU of vitamin D a day about 6 months ago. Three things have happened so far, he started losing weight, his blood sugars improved, and his acne went away. 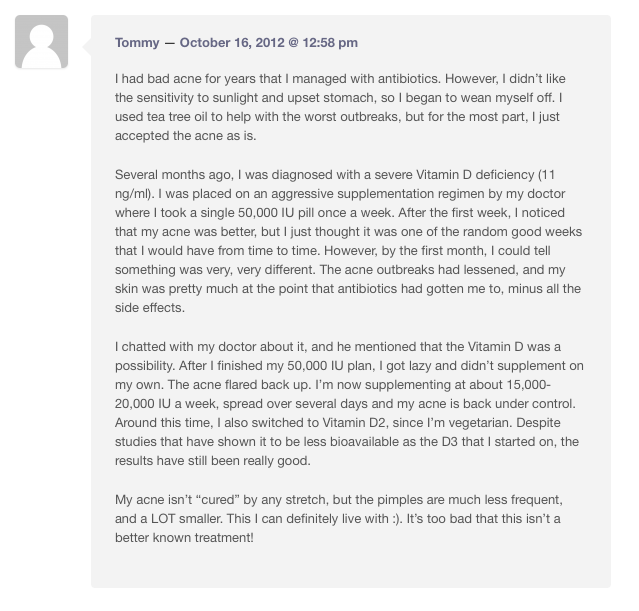 I know you have written about diabetes and weight loss with vitamin D but I can’t remember anything about acne? I have had some reports that vitamin D cured acne but frankly, I didn’t believe them. Then I ran across this 1938 paper. You can read the entire paper yourself and see what 5,000 to 14,000 IU per day did for these patients with severe acne. When I was a kid, I always wondered why my pimples got better in the summer and worse in the winter. Maynard MT. Vitamin D in Acne: A Comparison with X-Ray Treatment. Cal West Med. 1938 Aug;49(2):127-32. I’d love to sell you a blue light for natural acne treatment, but I’d much rather if you did not need acne treatment at all. Vitamin D3 is safe for all ages in the proper dosage, easy to get, and cheap. Please follow this link to visit the Vitamin D Council’s website to learn more about vitamin D testing, recommended dosage and target levels. The Vitamin D Wiki has a section dedicated to Vitamin D and acne.